It is incredibly fun to travel across the country in an RV. They provide the freedom to camp wherever you want (no need for hotel reservations), and you’re always at home. But, one thing that can be a little irritating is how difficult it can be to get in and out of your RV. Having a good, comfortable set of RV steps can make things much more convenient. If you are not handy with tools or don’t want to install steps on your RV, there are a variety of portable steps available. Also, they don’t take up much space and are quite affordable. 1. Adjustable-Leg RV Platform Step: These steps are lightweight and made from aluminum alloy. Their adjustable legs make them completely slip-proof, even on uneven surfaces. 2. Folding RV Step: Because of their stool-like appearance, folding RV steps are also useful as folding chairs. This RV step stool is the most cost-effective and hassle-free option for an RV step. All you have to do is pick it up and stow it, whenever it’s not in use. They usually come with two handles: one to open the steps and one to close them for easy storage. 3. Porch-Style Steps with Handrails: These types of steps are comfortable and sturdy. The handrails make them excellent for young children and/or the elderly. 4. Solid Plastic Box Steps: These steps are made from a solid piece of high-quality, durable plastic and contain no moving parts. They are extremely durable and are available in 2-step and 3-step models. If you are not the handy type, there’s no need to feel ashamed. Welding stairs to the frame of an RV isn’t something that most people are prepared to handle. This is especially true when you factor in the placement of the RV steps electrical connections and motor. If you instinctively feel like this is too much for you, then leave the installation to a professional. But if you think that you are up to the challenge, give it a shot. It all depends on what you feel comfortable with. 1. 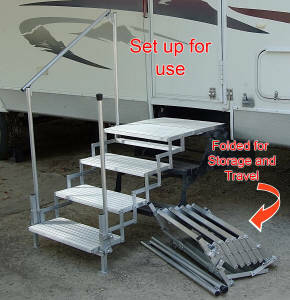 Manual RV Steps: This RV “add-a-step” is a versatile option that resembles a small ladder. It has hinges for easy addition or removal of the steps and is framed, bolted, or welded to the door. 2. Automatic Electric RV Steps: These stairs work at the push of a button or the flip of a switch. They come with a built-in electric motor that allows them to open immediately when you open your RV door. When you close the doors, they automatically retract; you never have to touch them. Like manual steps, they can either be welded to the frame or bolted to the door. The Kwikee RV Step is the most popular brand, and they are operated from an electrical switch inside the RV. You can mount RV steps onto your rig yourself, but dependent on the specific type, you may have to do some careful measuring. Make sure that you take the time to read the instructions. This will reduce your chances of making a mistake and ensure that you are using the right equipment. 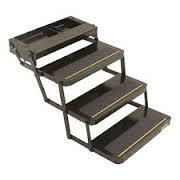 • Mechanical steps: If your electric step stops working, it can lead to dangerous situations. For example, if your sensor stops working and you step out of your RV without knowing that there are no steps, you can harm your feet or ankles. • Manual steps: Manual steps are not as strong as their electric counterparts. After years of weathering everything that Mother Nature throws at them, they have a tendency to weaken and may even break off. 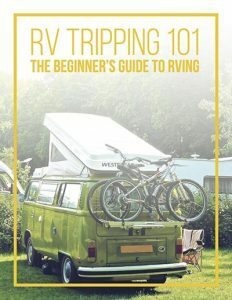 If you are an older RVer, this may put you at risk for hard falls. 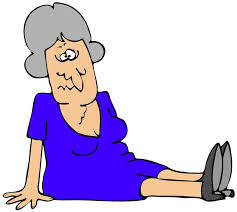 It is a must for every RVer to check their steps every few months for any signs of weakness and other damage. If any are found, there are some things that you can do yourself, but keep in mind that some repairs will need the expertise of a certified mechanic. If you decide to carry out the repairs yourself, be wary of the electrical system for the automatic steps. They can cause electric shock, if not disconnected when making repairs. Also, be sure to lubricate the hinge points with a good-quality lubricating oil. Some RVers use motorcycle chain lube as an effective replacement. A portable RV step stabilizer can also be quite helpful, especially for fold-down steps. It provides a firmer feel when entering and exiting your RV and will help slow down wear and tear. It manually screws up and down to adjust to the required height. Also you must be careful to prevent the steps from folding up automatically, because this can cause the stair motor to burn out. Also, be careful when retracting the jacks, because you could bend your steps by mistake. To prevent these issues, remove the RV step stabilizer before you pack up camp. In this way, you will not forget it and start the engine by mistake. * An RV step cover is an excellent choice to prevent slipping on the steps in times of inclement weather. They are available in a variety of colors. * An RV step rug will do an excellent job of keeping dirt outdoors and they are easy to clean. A small brush, used every couple of days, is all that’s needed. You’ll be amazed at how much dirt they trap. This RV step carpet will protect the interior of your coach while adding a nice accent to your exterior. *An RV step light will add safety as you exit and enter your RV. They usually can be found near the LED light kits. There are a variety of different kinds, even motion-activated ones. There are a large number of RV step options out there for you to pick from, and it may be easier to add steps to your RV than you think. With a little bit of research, you can simplify getting in and out of your RV.